In the four years since being forced off the professional tour for being gay, Daniel Bottega has taught tennis at a second-rate country club. He found a sanctuary to hide from an unkind world, while his lover, Jared Stoderling, fought a losing battle with alcohol addiction to cope with his disappointment of not playing on the pro circuit. Now Daniel has another chance at the tour by coaching tennis prodigy Connor Lin to a Grand Slam championship win. He shares his chance with Jared by convincing him to return to the pro circuit as Connor’s doubles partner. Competing on the world tour is challenging enough, but Daniel and Jared also face major media attention, political fallout from the pro association, and a shocking amount of hate that threatens Connor’s career in tennis, Jared’s love for Daniel, and Daniel’s very life. If the adage “write what you know” ever had a better fit it is in respect of author Alan Chin’s Match Maker. In his third novel Mr. Chin combines his knowledge and love of tennis and Buddhism with his storytelling talents to write a moving love story that is set against the world of professional tennis. Daniel Bottega and his lover Jared Stoderling were forced off the professional tennis circuit four years ago because they are gay. Since then Daniel has been teaching tennis at a local country club and Jared has been finding solace at the bottom of a bottle. Connor Lin is a young tennis prodigy that hires Daniel as his coach and serves as the catalyst for both Daniel and Jared’s return to the pro tennis circuit. Coaching Connor provides Daniel with the opportunity to convince Jared to return to tennis, first as Connor’s doubles partner and then as a singles player. As coach to Connor, Daniel inherits Connor’s father Roy who is ambitious and controlling and wants his son to become a tennis champion at any and all costs, a grandfather who wants Connor to follow his true life course and become a doctor, Connor’s best friend and warm-up partner Spencer and a host of extended friends and family that try their best to support Connor, Daniel and Jared in their endeavour. But the world of pro-tennis hasn’t changed much in the four years that have elapsed. Daniel and Jared find themselves once again facing systemic homophobia within the sport and as a result constant attempts to block both Connor and Jared’s bid, only to be further exacerbated by intense and intrusive media scrutiny. This puts strain not only on Daniel’s ability to effectively coach them and adds undue stress on Connor and Jared’s playing, but also threatens Daniel and Jared’s relationship and places Daniel in life-threatening danger. Throughout their journey Daniel holds steadfast to his deep-seated strength and determination to see both Connor and Jared advance and to take their rightful place as champions. But when homophobia and hatred turn to violence and alter Daniel’s life forever, Jared, Connor and the supportive family they have formed help Daniel to overcome the life altering obstacles that have been placed in his path. There is beauty and fluidity to the prose in this novel that easily allows the reader to become completely enveloped in the story and its characters. The author’s rich descriptions of the sport itself are seamlessly woven into the fabric of the overall story and rather than overwhelm the reader they provide for an authentic picture of both the game of tennis and of the inner workings of the tennis world. Through his descriptions the author conveys such realism in respect of the sights and sounds of the actual playing of tennis that the reader is transported court side. The tension and suspense of the game as Connor and Jared face-off with their various opponents whether as doubles or singles players is so palpable that at times I found myself holding my breath much as I do when watching a tennis match live or on television. The story is written in the first person from Daniel’s perspective and the author ascribes and extremely intimate narrative voice to this textured character. Daniel’s spirituality is the grounding element in his life and the filter through which he views and interacts in the world. It centers him and provides him with a steeled inner strength and peace despite the difficult issues that he and Jared face in their relationship, the obstacles that are constantly placed before them as they attempt their advance in professional tennis, the chaos that ensues around all of them, but most of all, it is the foundation that helps Daniel to come to terms with his biggest life challenge. As seen through Daniel’s eyes, the author also gives depth to the secondary characters and their respective journeys. While Daniel is the main protagonist he is also the lynch pin to the relationships that form and intersect between and among the characters and the author’s writing of the intricacies and nuances of these relationships is one of the strengths of this novel. Despite the many tensions in Daniel and Jared’s relationship due to Jared’s alcoholism and the difficulties they face in attempting a comeback there is a deep-seated love, commitment and tenderness between the two that simply shines through. Also prominent are Connor’s familial tensions and his dilemma of, on the one hand, pleasing his father by becoming a tennis champion versus following his heart and keeping his promise to his grandfather by going into medicine. Of note is also the special relationship that Daniel forms with Connor’s grandfather and the influence this has on Daniel’s coaching of Connor, his relationship with Jared, as well as how Daniel deals with the life-altering events in his life. In this sense, the secondary story lines that run throughout the novel and the ensemble cast of characters only add to the richness of the overall story. On a final note, although Match Maker is a completely different story, save for the fact that it deals with the theme of systemic homophobia in sport, I couldn’t help but feel that this novel was in some respects the author’s homage to Patricia Nell Warren’s internationally acclaimed classic The Front Runner. If so, then Match Maker is a befitting tribute. With only three novels under his belt Mr. Chin has emerged as a great storyteller. Match Maker is a beautifully written, poignant and uplifting multi-layered love story that I thoroughly enjoyed and wholeheartedly recommend. 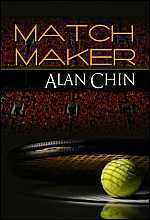 Match Maker by Alan Chin is available in ebook and print formats at Dreamspinner Press and Amazon, and in ebook format at All Romance eBooks and Rainbow eBooks. This entry was posted in Fiction, Indie Reviews, LGBTQ, Rainbow Reviews, Romance and tagged Alan Chin, Dreamspinner Press by Indie Reviews. Bookmark the permalink.